In between trying to keep up with anime that is from the past few seasons, I have been exploring series that I missed out on during the period of time that I wasn’t watching too much. By doing this I’ve found plenty of great anime and seen some ones that were clearly influential on some more recent works. Noir is thirteen years old at this point, but it’s another series I missed out on when it began airing in 2001. Produced by Bee Train, this is the first of three anime the studio would create that focuses on female assassins and the whole “girls with guns” concept. It’s an intriguing mix of stylish action and mystery, and while the plot didn’t come off quite as interesting during the second half of the series it was still fun to watch overall. Noir begins by introducing viewers to Mireille Bouquet, an assassin living in Paris. She receives a mysterious email inviting her to make a “pilgrimage to the past” and it contains a song that seems familiar. The email takes her to Japan, where she meets a mysterious girl with amnesia named Kirika who is attacked by men in suits. It turns out that Kirika has just as much skill as an assassin as Mireille, as she makes short work of the attackers. Mireille investigates the house where she has been living and discovers a pocket watch that plays a familiar melody, and agrees to help Kirika investigate her past with the caveat that she will kill her after they find out. The two return to Paris and begin taking on jobs as a pair, using the name Noir. The initial episodes spend equal time focusing on the pair’s ability as assassins as they take on jobs and their attempts to find out more about both of their pasts. As you might expect, it seems like the two of them have a shared history of some kind but at this point in the story it is unknown as to exactly what that is. Noir really stood out for the first half or so, as some of the ways that Mireille and Kirika are able to take out their targets are inventive and there are some episodes that pull at the heart strings. Early on there’s a situation where the two are trapped and being hunted by enemies with night vision goggles, but Kirika places popcorn on the ground so that when the kernels are stepped on the enemy location is revealed. There’s an emphasis on intelligent gunplay and scenarios like this early on, as well as a few episodes where Noir is tasked with executing some older war criminals that have changed their ways and are near the end of their life. Despite their attempts at atonement they realize they cannot escape their past, and these moments in the series stirred up quite a bit of emotion. As Mireille and Kirika head to different locales and take on various assassinations, they continue to investigate just who Kirika is and how their pasts are tied together. It doesn’t take long before they find out that they both have connections to a mysterious group called the Soldats, an organization that exists in the shadows of society and has been around even before the formation of the Italian mafia. It’s not that different from other television shows and movies that have gone for this “mysterious organization manipulating the world from the shadows” angle, but Noir does put an interesting spin on it as there seems to be some religious symbolism behind exactly what the Soldats are trying to accomplish. About halfway into the series, a third assassin Chloe is introduced, and while she initially seems as though she will be another enemy she ends up saving Mireille and Kirika from certain death later on. As the mystery started to come to a close towards the end of the series, I didn’t find myself quite as drawn in by the plot as I was early on. The unknown elements become fairly easy to predict before the twists actually happen, and there are a few too many action moments where instead of being smart and coming up with inventive ways to prevail both characters end up about to be killed only to be conveniently rescued at the last minute. 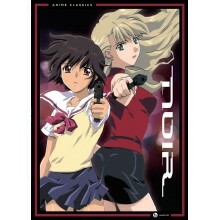 The second half of the storyline may have not captivated me quite as much as the first, but what propels Noir over your average action focused anime is the relationship between Mireille and Kirika. Initially they start off as partners that also have a potential of becoming enemies later on, but as the storyline progresses they develop a bond that is quite close. I’ve seen some critics give this a yuri tag, but I felt it was more of a close friendship between two women that shared a similar past and were moving forward into the unknown together against seemingly impossible odds. Kirika is the quieter, confused girl to Mireille’s more outgoing and feisty personality, but she actually ends up being the more skilled assassin in many situations and because of this the two work well as a team. Sometimes action anime attempts this type of relationship and drama between its cast, but it doesn’t always come off feeling realistic and often the characters are simply there as a means to drive the action forward. But Noir made me care about both of its main characters and when it did focus on their bond and moved away from the action it was still just as interesting. Keep in mind that this series is thirteen years old at this point, as the animation does reflect the early 2000s time period. But I think that compared to some of the others from this same time period, Noir has aged considerably better. It helps that Bee Train went for a very stylish approach that leaves all of the action scenes looking absolutely fantastic. Each one is well choreographed, and the ways that the two assassins are able to take out their targets (at least early on) seemed inventive enough that the shoot outs never became repetitive. Don’t expect a gritty, brutal style though, as the one thing that Noir doesn’t focus on is blood and gore. There are a couple scenes here and there where a character might get cut and a little sliver of blood is shown, but for the most part lots of enemies get shot with no blood coming out whatsoever. Overall there’s a softer feel to the animation, particularly during the non-action scenes, and this does give some of the more violent situations more impact. I also tend to really like anime set in European cities and towns, and that also helped Noir to stand out in my mind. One thing I wasn’t expecting from this series was how well the music fit each scene. Yuki Kajiura handled the soundtrack for Noir, and she composed pieces that perfectly complement the tension throughout the series. In particular, the somber, reflective songs really added to the mood of quite a few scenes and gave Noir a more serious feel rather than the crazy over the top nature of other anime. The opening and ending themes are fairly different when it comes to their sound, as the opener “Coppelia no Hitsugi” is a faster paced arrangement that captures the frenetic nature of the action sequences while closing number “Kirei na Kanjo” is a softer, reflective piece. I was really excited to see that “Kirei na Kanjo” was a Akino Arai song, as both of her ending themes for Outlaw Star have stuck with me for years. Mireille and Kirika are voiced by Kotono Mitsuishi and Houko Kuwashima, both voice actresses that anime fans will likely have heard in other roles. They both deliver great performances here, as Mitsuishi gives Mireille a strong yet vulnerable side, and Kuwashima brings Kirika’s innocent yet deadly character to life. Initially Kirika seemed like a fairly one dimensional character, filling the amnesiac role quite well, but later in the series her personality when through a fairly dramatic shift and Kuwashima was able to give a dynamic performance to help sell this. This is one of the main reasons I found the two leads to be so likeable, as their actresses captured the emotion and changing relationship quite well. Once Noir started to follow the “mysterious organization controlling the world from the shadows” angle I didn’t find it quite as captivating, and the action scenes started to become a bit too similar during the second half. But despite that, the strong bond between the two leads, stylish action, and surprisingly emotional moments had me glued to the screen eager to find out what type of situation would happen next. Action focused anime can have a tendency to be all about the fights/shoot outs with little substance in between, so Noir was definitely a nice change of pace. It’s not quite one of my all-time favorites, but is strong enough that I can see why many anime fans still hold it in fairly high regard even over a decade later.